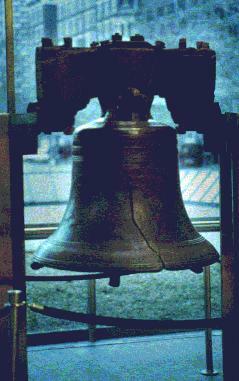 Our founders felt the principles contained in the Jubilee were so important that they had the Liberty Bell inscribed with words taken straight from Leviticus: "...Proclaim Liberty throughout all the land unto all its inhabitants thereof" (Lev.25: 10). Obviously the concepts underlying the Jubilee have something crucial to say with who we are not only as people of faith, but as Americans. Liberty: It's what the United States is all about. But Americans have an even stronger bond to the Jubilee. We like the Isrealites of old whom God is prescribing the Jubilee to are a land of exiles. "I am the lord your God, who brought you out of Egpyt to give you the land of Canaan and to be your God." (leviticus 25:38) Most of us are of immigrant stock, some of us came here unvolunteerily. But does the Jubilee speak to a time long gone? If we focus on the literal and look at the specific remedies God prescribed to Moses with the Jubilee celebration: cancellation of debts (Dt. 15:1, 15:9, 31:10, Neh. 10:31; Jer 34:14), the freeing of slaves (Lev 25:39, Ex 21:2), returning land purchased to its original owner (Lev 25:23-24) , letting land lie fallow (Lev 25: 4,11) it certainly appears dated. Slavery has been almost totally eradicated and the importance of land has diminished as we are no longer an agrarian society. But what was God after in the jubilee, the spirit behind it? and what have we learned in the last 3500 years? 1)Established the concept of Liberty and Freedom-With the exodus of the Isrealites from Egypt and the creation of the Jubilee. The idea of liberty was born in the world. In the Jubilee God is telling us how we should live amongst ourselves, how we should treat the environment, that we should rest and enjoy ourselves, how the world works and that we owe it all to God who owns it all. The Jubilee is one of the few places in scripture which talks about the larger issues in the world—which is becoming increasingly important in our globalized world which appears to be shrinking more with each passing day. Liberty--freedom for everyone is the central message of the Jubilee. The idea of liberty at the societal level is no different than the ‘golden rule’ or ‘the law of karma’ which rules at the interpersonal level; Do unto others. The remedies prescribed at the time all had to do with freeing people that had become enslaved, indebted or lost their livlihood--their land. The implication being no matter want contract had transpired--revoke it! The intent of the remedies prescribed in the Jubilee is clear: ‘Do not take advantage of (oppress) each other’. Leviticus 25: 17. We also get a glimpse of how God thinks those in power should rule in talking about the treatment of slaves:"do not rule ruthlessly over them" Leviticus 25:43. The remedies God was prescribing were bold and radical measures, to liberate and prevent us from taking advantage of each. Many would think that the system we operate in is fair, just and we do not knowingly take advantage of each. Such is the farthest thing from the truth. We have created a market-based system where Money Rules!. Government is under control of a plutocracy of special interests and wealthy. We have given corporations a special status reminiscent of Baal and Mammon. We have let liberty decay into a dry, dispirited discussion of laws rather than the inspiring dream and spirit it is. Worse pressure is building and the ability for the world to self-destruct increases with each passing day ( Time to Replant the Seeds of Liberty). Letting farmland lie fallow was prescribed by God in 1500 BC. It took a thousand years before the Romans started to let land lay fallow. And only in recent centuries that it has become universally accepted, although modern science does attempt to defy it. How strange and difficult it must have been for the early Israelites, dependent upon the land for their existence, to let their land lay fallow every seventh year—It made no logical sense, it was counter-intuitve and put their lives and livelihood at risk. It is only when we set others free that we will be freed. God also tells us in the Jubilee that the environment is sacred. He specifically presscribes that the land should lay fallow every seventh year " But in the seventh year the land is to have a sabbath rest." Leviticus 25:4 and that the land belongs to God , :…the land is mine" Leviticus 25:23. To many Americans this may seem to contradict our laws and principals of private property, perhaps. But rather it relates to the belief that our bounty comes from God and we must never forget it. And that we must be good to the land and treat it properly—if we expect it to remain fertile! The idea of rest is also central to the Jubilee. Rest in itself can be liberating from work. But rest in our world has special meaning. Today Americans put in more hours than in any other country in the developed world, worse many of us our tethered to our jobs via cell phones, faxes and computers. To some work has come to define who they are. Then there is the battle for our minds and attention as we are bombarded with advertisements and messges of all sorts that occupy our mind and try to mold our thinking. In today's world there is no rest for the mind. Quiet time is non-existent to many of us! Rest--we need it! Rest--without it we cannot reflect. Rest--without it we cannot hear God speak to us. Rest--we need it if we are to liberate ourselves! When we follow the counterintuitive remedies prescribed by God to liberate ourselves we are giving up control and placing our faith and trust in God to Deliver Us. The power of 'liberation' is clearly echoed by God. On several occasssions we are told "I am the lord God that brought you out of the land Egypt" (Lev 25: 38, 55) This refrain is echoed after the remedies are prescribed not only to remind the Isrealites where they came from but it was God's way of saying" I delivered you and set you free--so now you do the same!'" Or 'Free Others and Free Yourself." On the surface this idea seems so counter-intuitive, so ill-founded , so illogical--it should because it is dealing with spirit, not the mind--with love and kindness--the greater good.. It speaks to the power of love and compassion. And although God was speaking to the Isrealities his message is particularly apt for America which is a land of exiles that has been delivered and prospered. It is encumbent upon us to make sure that embrace the spirit of the Jubilee if we are to prosper and remain free. This age must face the challenge and embrace the liberating principals of the Jubilee. By doing so we will stop the 3,500 cycle of oppression and violence--of the oppressed becoming the oppressor and vice versa. The most marginal elements of our society--the weak, the economic misfits, the pariahs, the miscreants, the homeless, the mentally and physically handicapped and the countless hoard of others we similarly deject--are the seeds of our future. If liberated they will rise up to lead our children's children to an even better world. In doing so we will put our faith and trust in God to deliver us. To give us Manna when needed. We have to free others so that we may free ourselves. "Free Others... Free Ourselves...Free Others.. Free Ourselves..."
We can no longer wait to accept God’s message of ‘Liberation".